Safety Products from UniversalSecurityStore.com were meticulously designed to offer the maximum in peace of mind. Ensure you and your family’s safety from the many hazards presented by Fires, Smoke Inhalation, Carbon Monoxide and Gas Leaks with the purchase of an appropriate USI Alarm. 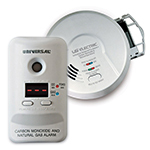 Our safety products include: Smoke and Fire Alarms, Carbon Monoxide Alarms and Combination Alarms. 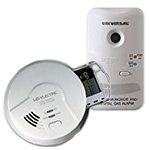 Many of the Alarms we feature incorporate multiple levels of detection. Our 2-in-1 Alarms, 3-in-1 Alarm and 4-in-1 Alarm ensure optimal safety by detecting a wide range of hazards. 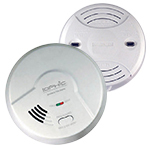 Our signature collection of Universal Smoke Sensing (ioPhic) Alarms provide the ultimate in reassurance and are capable of identifying multiple threats at an increasingly fast pace. Our catalogue is also stocked with Bathroom Ventilation products that include Bath Fans and Bath Fan Accessories. Browse through our secure online channels for Safety Products and Bathroom Essentials and outfit your home with a proven and trusted ally in USI. Our coupon discount is valid on the entirety of our Smoke and Fire, Carbon Monoxide, Combination Alarms and Bathroom Ventilation Products. Our selection of alarms is backed by industry defining technology and a series of patents exclusive to the USI brand. When it comes to securing you and your loved one's security, you can depend on the UniversalSecurityStore.com to deliver some of the most technologically sound equipment available in today's market.